Con un tremendo carisma y talento, Antonio Asfura hace su estreno mundial como cantante/compositor/autor con, «sin duda», algo único. El tema musical, compuesto por Antonio Asfura, Nicolás Tovar y David Anthony, tiene su estilo propio. Una fusión de ritmos que te pondrán a bailar desde el segundo que la escuches. Mientras que la novela, escrita por Antonio Asfura, es una historia basada en la vida real que te sumergirá bajo un ritmo imparable cargado de odiseas, verdaderas pruebas de valentía y honestidad, de milagros y de ejemplos de supervivencia. Una historia que estremecerá el corazón de quien la lea. Sin Duda, la canción y la novela, están dedicados fervientemente a todo aquel inmigrante obligado a dejar su tierra, sus raíces, su historia; y a todas las personas, que de una manera u otra, sin importar lo que cada uno en su corazón anhela, luchan por escribir de sus vidas una MEJOR historia. Visita tu tienda de libros digitales favorita. Incluye CD con el éxito Sin Duda en 3 versiones: Original, Club & Instrumental. AMAZON - GATBIK EMPORIUM, la tienda oficial de Antonio Asfura. With a tremendous charisma and talent, Antonio Asfura makes its worldwide premiere as a singer/songwriter/author, "certainly", with something unique. Antonio Asfura takes us back around 1920 to know the story of Yul Zurita, an immigrant who was forced to leave his roots and his country with just twelve years old. Relatives, friends and dreams were left behind to go in search of a better life, but always remembering his family traditions and his beloved city of Bethlehem. The music track, composed by Antonio Asfura, Nicolas Tovar and David Anthony, has its own style. A fusion of rhythms that will set you dancing from the second you hear it. While the novel, written by Antonio Asfura, is a story based on real life that will immerse you in an unstoppable rhythm charged with odysseys, real tests of courage and honesty, examples of miracles and survival. A story that will shake the hearts of those who read it. Sin Duda, the song and the novel, are fervently dedicated to all immigrants forced to leave their land, their roots, their history, and to all of those who in one way or another, no matter what their hearts yearn, struggle to write about their lives a BETTER history. Visit your favorite digital books store. 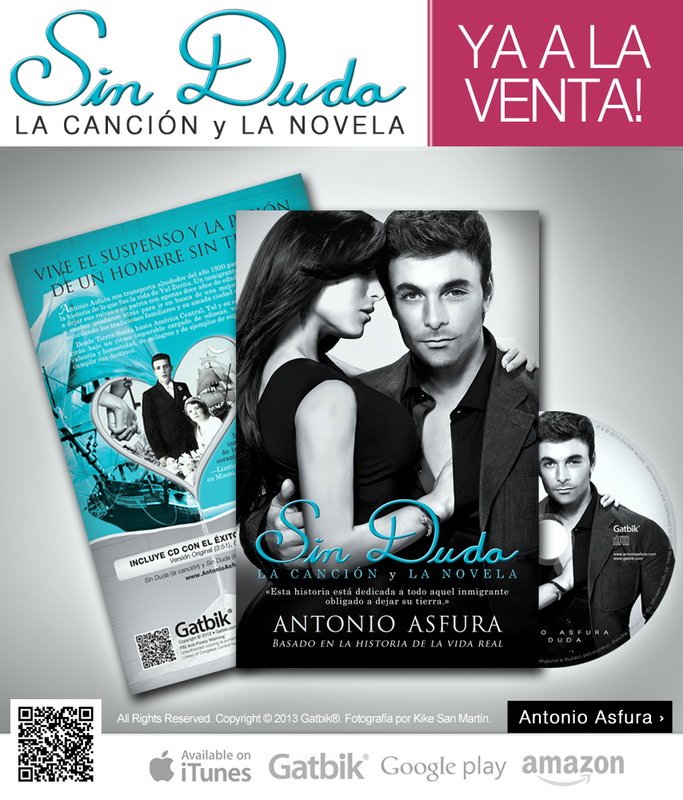 Includes CD with hit song "SIN DUDA" in 3 versions: Original, Club & Instrumental. AMAZON - GATBIK EMPORIUM, the official store of Antonio Asfura.